Crab grass killer for St Augustine grass is a much sought after product. People looking for it are often disappointed by not finding anything they can use. Others are upset by the lack of results or the unintended negative consequences from a product they do try. Are you in one of those categories? Let’s investigate the options you have when searching for a crab grass killer, especially for use on Southern lawns. Option 1: a commercial crabgrass killer that is designed for use on lawns, but has a warning that it may injure or kill St. Augustine grass. It is moderately priced. Option 2: a natural product that claims to be effective as a crab grass killer for St Augustine grass, without hurting the lawn. It is expensive, the price being prohibitive for a large area. Option 3: a homemade crab grass remedy that has mixed reviews on its effectiveness or safety for your lawn. It is inexpensive. Look at the details on each of these choices before you decide if you want to spend the money or take the risk. Commercial products available at garden retailers offer a chemical that is somewhat selective in the types of grasses or weeds that it kills. This allows gardeners to get rid of weeds like crabgrass without hurting most lawn grasses. The turf world has seen a number of changes in this area in recent years. Retail products that claim crabgrass killing power are now typically using an active ingredient called Quinclorac. Previously the chemical of choice was MSMA, but it has been banned by the EPA. Turf management professionals were allowed to use their inventory until Dec, 2013. Retail products with MSMA have been unavailable for some time. The following section on MSMA is being left on this page for reference & general information purposes. Also, some individuals may still have MSMA sitting on a shelf in the garage, or have it offered to them by someone. Read on to see if it is safe to use on St. Augustine. Info on Quinclorac will follow that section. This chemical is one of several in a category called methane arsonate, found under the abbreviations MSMA, DSMA, MAMA, CAMA and others. 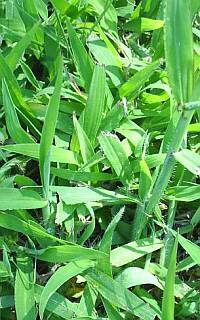 Its effects are usually restricted to certain grassy weeds: crabgrass, dallis grass, Johnson grass, quack grass, bahia grass, and perhaps a few others. Each manufacturer has its own listing, depending on the strength of the concentration, and what they have tested it on. A difficulty arises since the blade structure and growth pattern of St Augustine and centipede grass is similar enough to these weed grasses that they can be affected the same way. Most companies specify on the label “Do NOT use this crab grass killer for St Augustine grass - injury or death to the lawn grass will result”. Now for the conflicting reports. You can search the Internet and find numerous accounts by people who claim to have used MSMA on St. Augustine successfully, with no damage. Or they indicate there was only a slight effect on the lawn, from which the grass recovered fine. What is the truth? Forget truth for a moment. The reality is, you should never use a chemical product contrary to the manner described by the manufacturer on the label. To do so is unwise and potentially unsafe. You should also know, it’s illegal, (says so on the label) even though the authorities aren’t out looking for you. But if a serious situation developed, you would be held liable for not observing the rules. Since MSMA products are derived from arsenic, it makes sense to be cautious. A few manufacturers specify that their product can be used on St. Augustine, under certain conditions. This usually would be in a lesser concentration, and only at certain times of the year, or in a certain temperature range. (This is why reading the label is important!) There will likely be a lot of disclaimers thrown in because of potential risks. Crab grass is much more susceptible when it is young. Any of the MSMA products potentially could be sprayed at a low enough concentration to kill immature crabgrass weeds without damaging your lawn grass. So if you can locate the right product that has the approval, though limited, as a crab grass killer for St Augustine, you’re in luck. Observe all the instructions, and you should have a degree of success with your weed problem. If that is not available, some people try to spot treat their lawn, hoping for minimal damage. Do you want to take a chance on that? It’s a tough decision since crab grass can become so dominant in such a short period of time. Many people are willing to try anything in hopes of stopping this invasive pest, especially before it has a chance to start putting out seeds. It gets worse. Many authorities limit the expectations of controlling crab grass in any lawn with these chemicals. Most states conduct University Extension programs in Horticulture and through them provide information to consumers on best management practices for the home yard and garden. They consistently suggest that mature crabgrass can be resistant to these products. So if you did not start early in your attempts to control this weed, you may be disappointed if you rely on the MSMA type products. As the active ingredient in Crabgrass Killer products now sold in retail outlets, Quinclorac is not the knight in shining armor for owners of St Augustine lawns. While it is certainly a very competent weapon in our weed killing arsenal, it is NOT safe to use on St. Augustine grass, nor on bahiagrass, carpetgrass, centipedegrass, or dichondra. There is another product used as a Crab grass killer for St Augustine grass, named Atrazine. This also gets mixed reviews. Some say it works great, others say not at all, and everything in between. The significant fact is that Atrazine is labeled, in most cases, as a product for the “suppression” of crabgrass. This does not mean elimination, it means a certain measure of control. This may be helpful in your situation, particularly if you get a head start on treatment when the weeds are young. But… Atrazine is facing heavy controversy regarding possible harmful effects to individuals and the environment. As the most widely used herbicide in the United States, it is unlikely that it will be eliminated from the pesticide arsenal. It held restricted use status for a while until demand brought it back. Now the liquid is available only to licensed applicators. Granular atrazine is an ingredient in some products packaged for homeowners, particularly weed and feed. Atrazine sees significant use in the Southeast United States because it is one of the few herbicides that St Augustine will tolerate. Yet the fact that it only suppresses crab grass would lead many to consider repeat applications. This would intensify any potential health concerns. I recommend you personally research this chemical before deciding to use it at your home. Now for the healthy alternative. A product called AgraLawn Crab Grass Killer is for St Augustine grass, as well as centipede lawns and claims it will not harm them. Other lawn grasses are also safe, provided you follow label directions. The product has been around several years and is marketed by The Crabgrass Alert Company, in Florida. It has been advertised on TV, and is typically sold through on-line retailers. It appears to be well received by customers, though I have not tried it. AgraLawn is designated as a safe herbicide, using these natural ingredients: cinnamon bark, baking soda, wheat flour, cumin, and corn flour. It is applied as a powder that is absorbed through the leaves and kills the entire weed plant, without harming the surrounding grass lawn. The crab grass killer must be applied while the grass is moist. There can be no rain or irrigation for several days after application, so timing is critical on this if you live in an area that gets regular seasonal rainfall. The instructions state that the weeds will die if the product is left in place for 3 to 5 days. If you try it, plan accordingly, and keep your fingers crossed. 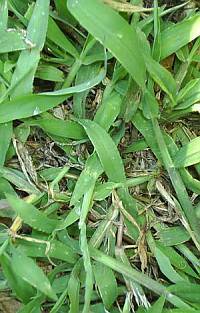 The company acknowledges that this crabgrass killer for St Augustine could discolor the grass during the hotter months, but it would be temporary and not long term harm. This sounds like the best of both worlds. You get effective control of the crabgrass, no significant damage to your lawn, and no risk to your health or the environment. The catch is the cost. If you have a small lawn, you may do all right. But we know that many of you have substantial lawn areas around your home. A two pound container of AgraLawn powder is offered at twenty dollars or more, depending on the supplier, the quantity, shipping, etc. The coverage is claimed to be 100 to 200 square feet for a 2 pound box. Calculated at the broader coverage, if your crab grass is not super dense in your lawn, that brings the treatment to at least 10 cents per sq. ft. If you have 1,000 sq. ft to protect, that will cost $100. A quarter acre of lawn would set you back over $1,000. Sorry to dash your hopes if you thought this would help your beautiful large southern lawn. On the other hand, it is cheaper than the cost of new sod, if you’re really getting desperate to take care of this problem. And for spot treatment if you are just at the beginning of an infestation, it could be well worth it. How does a home remedy sound? Some people who have considered the AgraLawn product, but balked at the price, figured they could probably do just as well with baking soda alone. Is that a possibility? It is true that some folks claim it works fine. It is purported that you can wet a patch of crabgrass, pour some baking soda on it, and in less than a day find the weed dead but the surrounding grass fine. I agree that baking soda should kill weeds. It is a salt, and would have the effect of drawing moisture out of a plant’s leaves. Once that happens the foliage dies. The root would not typically die, unless it was a young plant. So baking soda is capable of killing weeds, including crabgrass, but with only one application it usually would not be permanent. The question is whether or not the surrounding grass would be hurt. A number of sources claim that’s what happens. I don’t expect that should be the case, but I’ll reserve judgment because I don’t currently have any St Augustine grass to experiment on. You may be inclined to try it. I would love to get feedback from people on this. (There is a contact form listed on the navigation bar above.) I would certainly encourage caution, that you try a sample test on a small patch first. Another concern with using any salt product is the effect it will have on the condition of the soil. An occasional use of a salt based remedy may not present a problem. Repetitive or heavy applications could build up a level of salt in the soil that will have detrimental effects on both plants in the surrounding area and microorganisms in the soil. This could slow down the ability of the lawn grass to recover if it did suffer damage. There are many excellent alternatives to chemicals for many of the tasks you perform daily. Everything from bug killing to cleaning can be accomplished with a number of ‘natural’ methods or ingredients to reduce your exposure to chemicals and the cumulative impact on the environment. 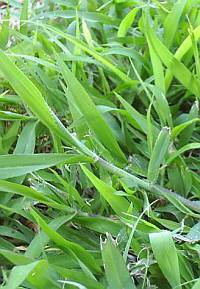 Unfortunately, a crabgrass killer for St Augustine grass does not offer many choices. There is a need to be discriminating and do research before you accept a natural control. For example, borax is also prescribed as an organic or natural crabgrass killer for St Augustine grass. One source cites using either Arm & Hammer (baking soda) Laundry Detergent or 20 Mule Team Borax directly on the crabgrass. This is a problem. Borax would deposit boron in the soil. Boron is a necessary nutrient for plants, but it would be worse to have too much than not enough. An abundance of boron is toxic to plants and it does not readily leach out of the soil. Use common sense, be diligent in checking out your sources, and always do a test trial when you go the path of home remedies. Click on this link to read another article and learn more about the impact of home made weed killers. Until The Crabgrass Is Gone! Realize that if you enlist any of these methods as crabgrass killer for your St Augustine lawn, you won’t like what you see at the end of the treatment. It would be nice if you could apply a product and the crabgrass went away, leaving a nice green lawn behind. Instead, the crab grass will look terribly ugly while it’s dying, and then you have to deal with the dead weeds. If the weeds were not overgrown, the St Augustine grass may be able to spread over them eventually, causing you no more trouble at this point. If the crab grass was mature, forming thick mats or clumps, it may have killed off significant amounts of your lawn. This dead crabgrass should be pulled up. 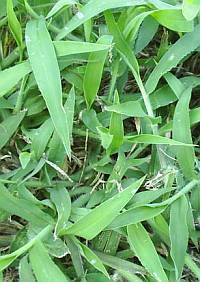 Crabgrass contains a substance that inhibits the growth of competing plants. It is better to get rid of crabgrass, dead or alive. When you remove the dead clumps, you want to avoid leaving bare areas of ground where all types of new weeds can germinate. If the bare areas are large it would help to take some plugs from a good patch of lawn, and start them in the bare spot. Considering this, some people realize that in many cases, the most practical thing is to pull up the crabgrass by hand. If it is so dense that even the dead weeds will cause more labor, why not pull it first? Save the worry and the difficulties that arise when you are trying to locate and use crabgrass killer for St Augustine lawns. Go To Crabgrass - Main Page for additional articles on this topic.